If a feature-packed, full-size pickup truck is what you are looking for, come to Headquarter Nissan to see the incredible 2017 Nissan Titan XD. This truck is much more than just a hard worker. Inside the cabin, you get amenities usually reserved for those driving a luxury sedan. With several models available with either a gas or diesel-powered engine, the Titan XD is surprisingly luxurious for a rugged, powerful pickup truck. Inside the cabin, you will discover seating for up to six passengers. A great number of comfort, luxury, and tech features make this versatile and large pickup truck a pleasure to own and to drive. a configurable rear seat area adds to the truck's adaptability, providing you with the option of a workspace, additional seating, and a lot more. 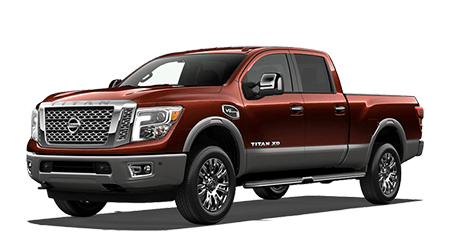 If you are near Columbus, GA, and you are searching for a full-size pickup truck with top-notch performance, ample towing capacity, and a spacious truck bed along with several storage compartments, come to Headquarter Nissan today to see all that the Nissan Titan XD has in store for you. Our welcoming Columbus Nissan dealership has a complete selection of the new Nissan Titan XD, as well as many other incredible new Nissan vehicles, so come on down and see us today! Get started right now by shopping on the Headquarter Nissan website. Choose the new Nissan vehicle you want, and then call us to book an appointment for a test drive. Our sales team is waiting to get you into the driver's seat of the 2017 Nissan Titan XD for a test drive now! Do you have questions about the 2017 Nissan Titan XD's interior features? Contact our sales representatives today to get answers! We are here to help you! The 2017 Titan XD offers Nissan's Vehicle Security System (VSS) and the Nissan Vehicle Immobilizer System to help keep your Titan XD from being stolen. Contact Headquarter Nissan to learn more or to get answers to your questions about the 2017 Titan XD's security or safety features. Buying the new Titan XD means you have a lot of options. You can opt for a gas or diesel-powered engine. There are four models available, each with its own set of amenities and features. The Titan's trim levels include the Titan XD S, SL, SV, or Platinum Reserve. The S is the base model, and the Platinum Reserve is the "loaded" trim level. To get details about each model's features and amenities, contact Headquarter Nissan. The 2017 Nissan Titan XD is powered by Nissan's standard 5.6-liter DOHC 32-valve V8 engine mated to a seven-speed automatic transmission. The powertrain delivers 390 horsepower at 5,800 rpm and 394 lb. ft. of torque at 4,000 rpm. This hardworking, full-size pickup truck can tow up to 11,260 pounds! It can also haul a load of up to 2,590 pounds in the truck bed! Are you eager to learn more about the 2017 Nissan Titan XD's performance, engine specs, or towing capability? At Headquarter Nissan, we invite you to come in or call us today to find out everything you want to know! Come to Headquarter Nissan to find the 2017 Nissan Titan XD! Our sales representatives are ready and waiting to take you out for a test drive with the new Titan XD today. We can't wait to show you how luxurious this full-size pickup truck is. Let us show you all of the incredible features in the 2017 Titan XD today! If you are looking for comfort, you should know that, inside this rugged pickup truck, you can experience the comfort and amenities you would usually find in a luxury sedan. If you want cutting-edge tech features, the 2017 Nissan Titan XD has that covered, too! This new truck is loaded with high-tech features you will wonder how you ever lived without. Visit us today to see them in action for yourself! Come on in to Headquarter Nissan to find your 2017 Nissan Titan XD, or to see any of the fantastic Nissan vehicles in our current stock. You will find our dealership located at 1725 Whittlesey Rd in Columbus, GA.